Are We Grateful for All that Gives to Us? We tend to focus on the faults of the younger brother when reading the Parable of the Prodigal Son. His sins and struggles are really obvious. He lacks gratitude for all the Father has given him. He covets a life of excess in a far country. There he finds that this sort of life always ends in misery as he wastes his inheritance. His sin draws our attention in the story. It is open and notorious. We all tend to clearly identify the younger brother’s version of sin. The parable is even named after him in most Bibles. Despite this, it is not the younger brother who is in trouble at the end of the story. He repents of his sin and is with the family celebrating when we last see him. He is redeemed and enters into all that the father prepared for him despite his great sin. Rather, it is the older brother who ends up angry and resentful with the father. The story concludes with him out in the cold refusing to join his father’s party. The older brother’s fate is the chilling negative moral of the lesson from Jesus. When we understand that the father in the parable is a picture of God, we see the brother ends up in a terrible place. God is celebrating. God is having a banquet and the older brother is begged to come in and celebrate. His sins cause Him to refuse. We never want to be in that position, right? What leads the dutiful older brother to opposition to God? It is the same sins as his younger brother. He doesn’t appreciate what God has done for him. He also is so concerned with what someone else, his brother, is getting that it destroys him. Bitterness is born, allowed to take hold and then consumes him. Looking at the greener grass next door leads us to disdain our own grass. He disdains the opportunity to enjoy what he has himself. His sins are covetousness and lack of gratitude, same as his little brother. They twist him and lead him away from the father just like they do the younger brother. The sins just look better on him. It is the same result, it is just hidden behind a veil of respectability. These two sins often work in concert on our lives to rob us of the joy of what our Lord is providing for us. We can be so concerned with worrying about what we don’t have and what others do that we never appreciate God’s overflowing abundance to us. We are so angry at others who are enjoying the lavishness of the Lord we never see our own bounty. We refuse to enter into the Father’s life of celebration because of our pettiness and lack of faith in God. Is our distrust of God’s provision leading us to a Christian life that is stunted and less than what He offers? In the parable, the father rejoices when the younger brother returns from his time of sin and waste in the foreign land. He immediately accepts the son back into the family. He gives him a robe and a signet ring which were both signs of power and position at that time. The fatted calf is slaughtered. A party is ordered to celebrate the return of the son. This is a wonderful picture for us of what happens in heaven when one of God’s children return to His loving care. 1 – The things that the older brother is so mad about the father wasting on the younger brother belonged only to the father. They never belonged to the older brother. The younger brother did not take his property. It was the father’s to give or not based on his will. The brother did not insult his older brother’s dignity. All of the grievances were the fathers. Any sins committed were against the father and him alone. 2 – The father has treated the older brother wonderfully. He has provided for him, loved him and given him everything he can. The sins of the younger brother had no direct impact on the father’s relationship with the older brother. He continued to love, care for, forgive and supply the needs of the older brother. Yet the older brother’s heart is so twisted by sin that he cannot see his father’s love and care. All the older brother sees is what “the other” has done. He is obsessed with what has been wasted, likely because he wanted it to be his, and can’t enjoy what they have. He does not see the abundance the father has bestowed upon him is not deserved. He is not grateful for all of his father’s patient love and care for him during the whole time the younger brother was gone. He does not understand the father at all. The older brother even thinks badly of his father when he forgives the younger brother. He fails to see that this is the father expressing the same love for his younger brother that the father expresses for him. It is an expression of the character of the father that should make the son rejoice. Instead, the son disdains it showing that despite all the father has done for him, he doesn’t understand the father at all. He lacks the same love of the father that leads him to take such great care of his sons. This lack of relationship and understanding robs him of enjoyment of life with the father. It also leads him to a stunted life with the father. Have we thought about what this means in light of the older brother’s grievances? What stopped him from having the feast with his friends that he claims that he wanted? What stopped him from enjoying his time in a faithful relationship with his father? His own understanding of the father. His lack of trust in the father. His lack of relationship with the father. His twisted view of the father. If all that the father had belonged to the son, he could have thrown a feast for his friends at any time. It was the son’s goat to do with as he wished if he trusted in the father’s love for him. The older brother could have been enjoying every single day basking in the father’s abundance. He could have been feasting daily. He could have been loving his dad for taking such good care of him and giving him a great life with his dad. Instead, the brother just can’t stop stewing over the fact that he is working while his little brother is off gallivanting. It is awful to think about, isn’t it? What a waste! Yet, our own hearts can be just as deceitful as the older brothers. This example can be applied to every area of our lives. All the good things that God provided for us turn to bitterness and disappointment in a moment. Instead of enjoying the abundance that God has showered on us and His loving blessing, we become resentful and angry with the One who made us. An ungrateful and covetous heart kills the joy in our lives. No matter what God provides for us, it is never enough. This leads to us never enjoying anything God gives us because there is always someone to compare with. Anything judged with a heart filled with covetous comparison is never truly enjoyed. Jesus deals with this very issue towards the end of His earthly ministry. In John 21, Peter inserts himself into the relationship between Jesus and John. He has heard that John will live until Jesus returns. Peter is dying to know whether this rumor is true. He tries to find out whether John will live longer than he will. Jesus has a wonderfully simple response. Don’t worry about what Jesus does to anyone else. That is between them and Jesus. 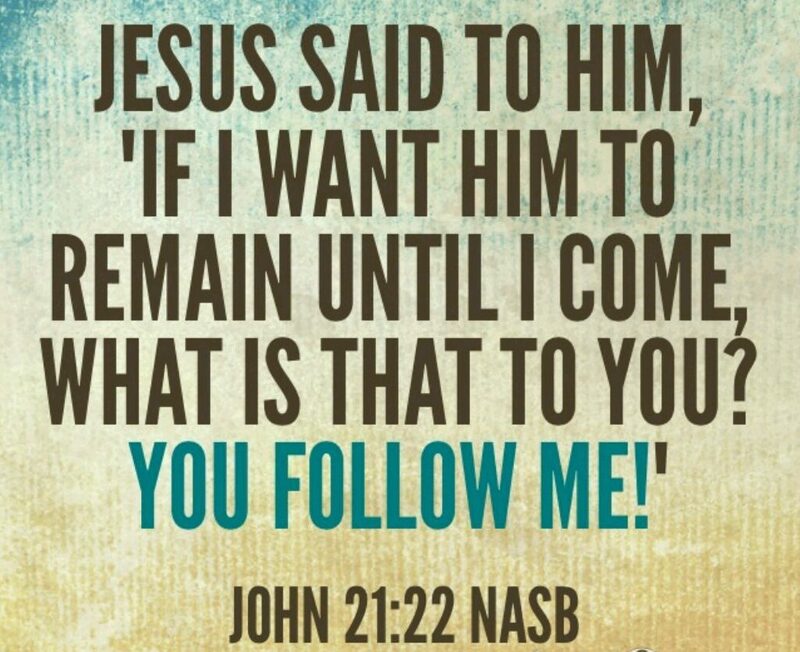 Just follow Him, look to Him and trust Him and you will be content. If we follow Jesus and be grateful for every single moment and thing we have with Him, then He will really show us what He meant when He said that we would have life abundantly. We just have to trust Him and be willing.